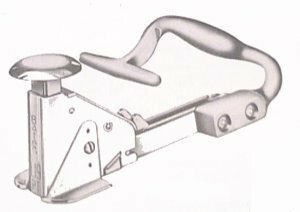 The LEGEND ALL STEEL (BATES TYPE) PATTERN TACKER is indispensable in the garment industry. It's used to tack paper patterns to cloth that is to be cut. Contoured handle permits fast one-hand action. Two side-wings provide stability. Unit parts are case hardened and chrome plated. Uses L19 staples (1-4 in, 3-8 in, 1-2 in).